Self-styled Islamic State has developed a new "special forces" style of combat to target Europe, the director of the EU's police agency Europol says. 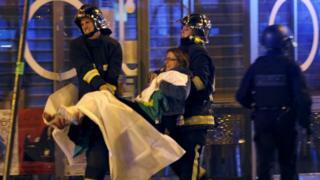 More attacks like those in Mumbai in 2008 and Paris last November could be being planned, Rob Wainwright said. He was speaking as Europol opened its new counter-terror centre in The Hague. The need was highlighted in particular by the Paris attacks on 13 November that killed 130 people. On Sunday, the Islamic State group posted a video apparently showing nine of the suspected gunmen before they carried out those attacks. The opening of the centre coincided with Europol's new report on IS. The Paris attacks and the downing of a Russian airliner over Egypt last October "suggest a shift in IS strategy towards going global", it says. "IS is preparing more terrorist attacks, including more 'Mumbai-style' attacks, to be executed in member states of the EU, and in France in particular," the report, Changes in modus operandi of Islamic State terrorist attacks, says. "The attacks will be primarily directed at soft targets, because of the impact it generates." It suggests refugees fleeing Syria and other nations for Europe may be vulnerable to recruitment. "Indeed there are reports that refugee centres are being specifically targeted by Islamic extremist recruiters," the report says. Mr Wainwright said more than 5,000 EU nationals had been radicalised fighting abroad and many had returned home. Europe's leaders, he said, had decided to establish "for the first time a dedicated pan-European operational centre to combat terrorism". Mr Wainwright said the centre's priority would be to improve information exchange between EU members. It will also focus on links to other criminal sectors. Mr Wainwright said: "We know that many terrorist suspects, such as those responsible for the terrible attacks in Paris, have a criminal background, are linked with the drugs sector, firearms and other criminal sectors. "Critical to Europol, therefore, functioning as the EU's information hub on countering crime and terrorism will be to uncover those links." The new unit will have between 40 and 50 experts in counterterrorism. Europol has in total about 800 staff at its headquarters in The Hague. They work with law enforcement agencies in the 28 member states and in other non-EU partner nations to combat serious crime.